The staff, volunteers, and animals at the Knox-Whitley Animal Shelter in Rockholds, Ky., are asking for the public’s help to make a holiday miracle possible after their shelter burned down in a devastating fire last Friday night. The first started on the evening of November 29; police do not suspect foul play. Whitley County Sheriff Department Detective John Hill arrived at the scene shortly before 10:00 p.m. that night. “When I got there, there was smoke coming out of the roof and I immediately called the fire department,” Detective Hill remembers. Members of the Woodbine Volunteer Fire Department and Detective Hill raced around the burning building, frantically freeing animals as the smoke and flames filled the rooms. 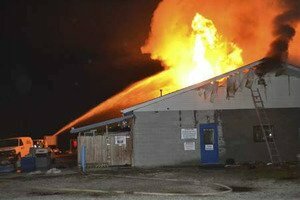 Though the emergency workers tried to open as many kennels as possible, many lives were lost as the fire engulfed the entire facility and the roof caved in. According to LEX18.com, it took two to three hours for firefighters to get the fire under control before they could go back inside the charred structure to recover more animals. While some animals were found quite frightened but alive, other pets were not so lucky. One dog has been confirmed dead in the aftermath of the fire. Beloved shelter mascot, a Basenji mix named Sassy, is believed to have died of smoke inhalation, the Times-Tribune reports. Sassy lived at the facility and greeted visitors, brightening everyone’s day. But even though she’s gone, shelter staff and volunteers remember Sassy for her happy personality and her many kind deeds. Tragically, at least 29 of the shelter’s cats and kittens died in Friday’s devastating fire. The cats were housed in an interior room in the center of the shelter, precisely where the building’s roof collapsed. Also lost in the tragic fire was Yoda, the Knox-Whitley Animal Shelter guinea pig. Shelter staff took to Facebook Saturday to memorialize their little friend. Those who volunteer at the Knox-Whitley Animal Shelter are completely devastated by the immense loss. “It’s basically like walking up to a family’s house and seeing it burned down,” volunteer Brandi White tells WBIR. White, who visited the shelter almost every day, was concerned for the wellbeing of all of the animals, but especially Bugsy, an elderly Basset Hound who called Knox-Whitley Animal Shelter home. White has since officially adopted the gentle Hound dog. Shelter volunteer Melinda Barnhart was one of many community members who have joined forces since Friday’s disaster. “I cried and I cried and then I said we got to help so that’s when I jumped in my car to see what we could do,” Barnhart tells WATE.com. Barnhart and her daughter printed out photographs of all of the shelter animals to try and figure out which were missing. Their efforts revealed that all but one of the surviving animals had been accounted for; a dog ran away during the fire and has not yet been found. While the shelter did have insurance, the money will not even come close to what the group needs to continue their lifesaving efforts. In addition to the building itself, many supplies were lost, too. The shelter is currently looking to borrow or lease a temporary building for 3 to 6 months so they can continue their good work while they start the recovery process. The ideal building would be at least 1500-square-feet with electricity, water, heat, and located in either Knox or Whitley Counties. Anyone with information about a temporary location is asked to contact Chuck Ledford at 606-627-9477. If you would like to help the Knox-Whitley Animal Shelter get back on their feet, please consider making a donation to the shelter’s PayPal account. Donations are also being accepted at two branches of Forcht Bank in London, Ky., and Corbin, Ky., Knox County Veterinary Services in Barbourville, Ky., and Whitley County EMS in Williamsburg, Ky. Visit the Knox-Whitley Animal Shelter Facebook page for more information on how to donate and for updates on the recovery process.